This ECG educational blog runs alongside Twitter. A new ECG is launched most Monday nights, in term time. Cases are generally aimed at Primary Care. Please use the Hashtag #ECGclass if you want to ask the patient any questions, or request any further investigations. Remember there are no right or wrong answers! ECG interpretation is often open to debate, and will usually evolve as new information becomes available. Everyone's opinion is valid, and useful to others, towards this evolution process. Today's case is adapted from old ECGclass, from the early (pre-blog) days. A 74yrs gentleman comes to see you with funny turns. His wife describes him as having brief episodes of transient 'faint-like' attacks, when he seems unresponsive for a moment, and looks very pale. On one occasion he actually collapsed, but came round moments later. 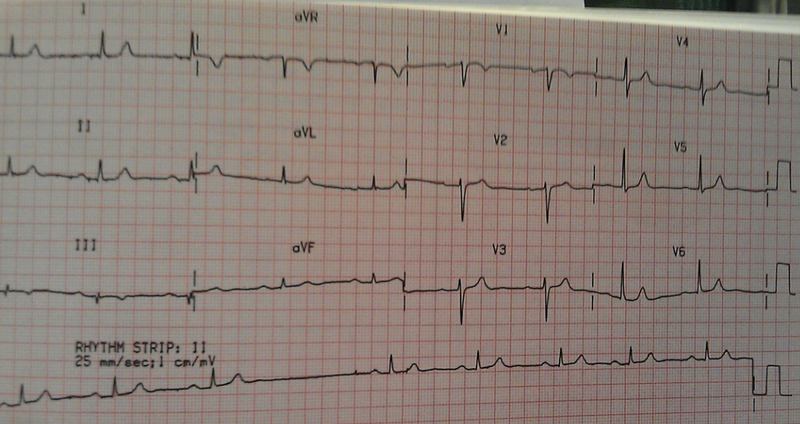 Obviously - you want an ECG - this is #ECGclass after all! Q1. Is the rhythm Regular or Irregular? Q2. Can you see P-waves? Q4. Does the P-QRS morphology look normal, or abnormal? This is a 12 lead ECG, on which electrical activity can be seen. The gain calibration is noted and normal, but no paper-speed is noted. For calculation purposes, we will assume standard paper speed of 25mm/sec. P waves, which are usually best seen in V1 and V2 , are not clearly seen in these leads, but can be clearly seen in other leads. The P and QRS morphology both appear normal in shape. There are large R wave amplitude deflections in Lead I and the chest leads, consistent with voltage criteria for left ventricular hypertrophy (LVH). The ST segments in the infero-lateral leads, also show typical down-sloping "strain" pattern often seen with LVH. The P waves, where seen, are normal in duration (2-3 small squares) and height (<3mm high), and consistency (same appearance throughout). That all sounds like quite impressive banter, and not bad at all, considering you haven't even had to plump for a diagnosis yet! All you've done so far is 'describe what you see". The P-R interval does alter, making it impossible to calculate. When there is no relationship between the atrial and ventricular depolaristions, they must occurring independently, from separate pace-maker sites. In other words, Atrioventricular dissociation is present. 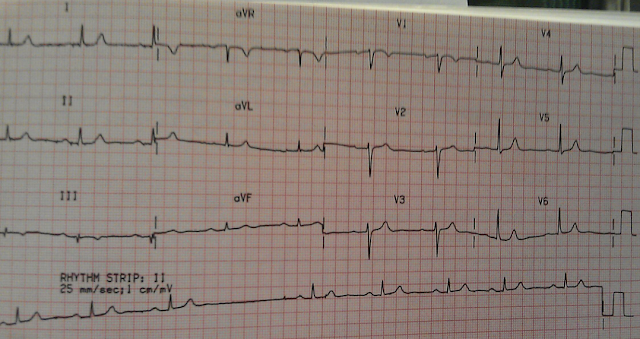 This ECG shows complete heart block. But what about the QRS Morphology? We've said it's normal. This ECG shows a narrow QRS complex escape rhythm. The QRS complexes often seen in ventricular 'escape' beats are broad, and oddly shaped in appearance. This is because of the abnormal spread of the depolarisation from the 'make-shift' safety-net pacemaker, as it misses the usual conductive tissue pathways. If, however, that abnormal pacemaker focus just happens to be very high, close to the original one, and is situated proximal to the bifurcation of the Bundle of His, then it is a junctional pacemaker and the QRS complexes will be close to normal morphology. The symptoms described by the patient are classical of Stoke-Adams Attacks and result from a sudden drop in cardiac output, and therefore cerebral perfusion. Recovery is rapid when the cardiac rhythm is restored. This patient is at high risk of sudden death and should be admitted for a permanant pacemaker insertion. Complete Heart Block (CHB) - Otherwise known as Third degree heart block. Complete heart block is a potentially life threatening arrhythmia. ABCDE guidelines should be instigated in a symptomatic patient and The Resuscitation Council UK 2010 Guidelines for "Adult Bradycardia" should be followed. In CHB the Sino-Atrial node functions normally so atrial contraction is normal, and P waves are present and normal. But...the electrical impulses are blocked at the Atrioventricular node, so NO beats are conducted to the ventricles. To compensate for this, in order to maintain cardiac output, the ventricles are excited by a 'slow escape' mechanism from a depolarising focus within the ventricular myocardium. There is no relationship between the P and the QRS waves. The Ventricular rate is SLOW. If you ever see slow QRS complexes without associated P waves, you can generally assume a Ventricular escape rhythm. The QRS complex is often, but not always, abnormal in shape (for the reasons discussed above). ACUTE. Myocardial infarction (MI). CHB may also be transiently seen during an MI. As discussed above, CHB gives rise to a slow ventricular escape rhythm, and the atrial rate is faster than the ventricular rate. This rate difference helps differentiate between AV dissociation of excessive bradycardia and Complete heart block. Enjoy a beautiful Christmas Everyone. See you back at #ECGclass in the New year. ECG interpretation is often open to debate, and will usually evolve and change as new information becomes available. Everyone's opinion is valid, and useful for others, as the evolution process takes place. Together we will try and form an interpretation based on the trace, and information, we have in front of us. Don't worry if you disagree - shout up and share your thoughts - the diagnosis is often arguable on the basis of a 12 lead trace, and may only become more obvious when a longer rhythm strip is available. There are large R wave amplitude deflections in Lead I and the chest leads, consistent with voltage criteria for left ventricular hypertrophy (LVH). When you've had a go, you'll find the full discussion on the next blog! Remember there are no right or wrong answers, and everyone's opinion is valid. An 82yr old lady is brought to see you by her daughter. She is complaining of intermittent dizzy spells. On examination, the lady appears frail, but clinically well. Her BP is good and heart sounds are normal. Her pulse seems a bit irregular, but not fast. Please use the hashtag #ECGclass for any thoughts and questions. The ECG shows a Sinus bradycardia, with a variable rate of around 50 beats per minute. (Remember how to calculate the rate of an irregular ECG? Count the number of complexes in 6 seconds and multiple this by 10. Assuming paper speed of 25mm/sec then 6 seconds = 30 large squares). Now study the Lead II rhythm strip. There are P waves in front of every QRS complex, and the P waves appear morphologically constant and normal; as do the QRS complexes. Every P wave is conducted. The PR interval is constant, but slightly prolonged (at just over the max. of 5 small squares, or 0.20 secs). So a First degree AV block is present. You also note a 'pause' on the long lead II. No P wave (and no QRS complex) occurs when expected. If this pause was interrupted by an odd looking QRS complex, this would be called an "escape" beat originating from an abnormal site within the ventricular wall. However, no escape beats are seen, and the pause is terminated by a sinus beat. You are concerned about the ECG and ask a bit more about her dizzy spells. Her daughter is discloses that she is worried, that on at least one occasion, she thinks her mother may have transiently 'blacked' out. Q2. What are you thinking now? What do you think of the pauses now? This looks a bit more sinister. Far more pauses can be seen. The duration of each pause is double the basic R-R interval. The ECG's show Sino-Atrial block. You may want to do ambulatory ECG recording to look for longer pauses (ie. failed conduction of several consecutive sinus beats, which will gives pause durations in multiples of the basic R-R interval). Given this lady's symptoms of possible blackouts, she probably needs admitting, or urgent referral, for permanent pacing. Sino-atrial block is one form of Sino-Atrial Dysfunction, or Sick Sinus syndrome. Others types include Sinus Pause, Sinus arrest, and Bradycardia-Tachycardia Syndrome. SA Dysfunction is a sign of diseased tissue around the sino-atrial node. This may be damage secondary to an MI , or to a degenerative ageing process affecting the node. Although the sinus node depolarises normally, there is intermittent failure of that impulse being conducted through the atrial tissue. 1. Be very suspicious if you ever suspect Sinus Arrhythmia in the elderly. Sinus arrhythmia occurs with respiration in the young and healthy. The rise and fall of the heart rate is gradual with respiration. In the elderly, sinus arrhythmia is rare. Study the R-R interval, if the distance is always in multiples of the basic rate, then a Sino-Atrial block is far more likely in this age group. A First degree AV heart block (prolonged PR interval) results when each wave is conducted from the Sino-Atrial node to the ventricles, but something slows it down. A Second degree AV heart block would be present if all the P waves are normally conducted, but occasionally a wave is not conducted to the ventricles at the Atrio-ventrcular node; nor through the Bundle of His. (i.e. Not all P-waves are followed by a QRS). Atrial contraction is normal, but no beats are conducted to the ventricles. To compensate, the ventricles are excited by a "slow escape" mechanism, starting from an abnormal focus within the ventricles. Thus the atrial rate is normal, but the ventricular rate is often very slow. There is no relationship between the P waves and the QRS waves. A Sinus Block occurs when there is complete failure of the sinus node to depolarise the atrium. In a sino-atrial block, the P-P interval remains regular (as in above ECG) but an entire PQRS complex will be occasionally missing. Would any other investigations be helpful here?